It is so hard to pick just a few things when we want them to have it all, so we'll see which things we finally settle on. But for now here are a few of our top contenders for the little fellas (ages 1 and 3). 1. Bilibo or Bilibo Minis - these are open ended creative play toys with a lot of possibilities. We gave Baby Brother the mini set for his birthday this year. 2. Art Supplies - a nice all-in-one kit like this one is great because they can easily use it on the go. 3. Bow and arrow - there are even some great handmade options (support small crafters!) like this one on Etsy, and you can even make your own target with this tutorial! 4. Outdoor Supplies, Toys, and Games - try some gardening tools, a disc golf set,or build a playhouse! 5. Lincoln Logs - watch out because some of the sets are mostly small pieces, but this set seems to have a pretty good mix for creative building. 6. Slackline - or other active toys like this are great for boys! Sierra Trading post offers discounts pretty often so keep an eye out! 7. Dress Up Clothes - if you're looking for the DIY route there are several great ideas near the bottom of this post. 8. Stick Horse - check etsy for some handmade options try making your own and maybe and extra for when friends come over. 9. Ride-on Toys - go for something that will last like a scooter or balance bike. 10. Wooden Play Sets - there are tons of great handmade sets like this wooden barn on etsy, or try these wooden construction trucks. 11. Wooden Building Sets - boys love to build! Try adding a unique building option with something like this set of cubes and planks, or this set handmade from branches. 12. Boots/Shoes - this is a chance to get a great pair of shoes that are little-feet friendly! Look for things like a flexible sole, wide fit, and a heel that isn't above the toe. Toms shoes are great and always donate a pair when you buy one and Stonz booties and rainboots are great winter footwear (if you're looking in the summer Unshoes are a great option!). 14. This year we're thinking of some fuzzy warm hoodies like this or this (I can't find where to buy this one so I may try making one). But you could definitely put shoes into this category instead! 15. Classic Books - we love Juniper Books and they have a beautiful boys' adventure set that would be perfect for a good reader. 16. High Five magazine - we've been getting this for a year and love it! A new magazine every month full of short stories, games, and crafts! 17. Photo Storybook - this year we took pictures of the boys acting out a story (my sister helped out and drew some bears for us to photo-shop into the pictures) and are getting them printed in photobooks from shutterfly.com. We would also highly recommend a big set of legos duplos and wooden train tracks if you don't have them. They have gotten us through many a rainy day! And season passes to a zoo or museum are a great gift that you can use over and over (and you can make the kids their own zoo passes with this free printable!). And if you want more DIY ideas check out my tutorials for a child size messenger bag, wooden animal treehouse, roll-up car mat, and monster snuggle blanket! Now all we have to do is narrow it down to just four gifts each. Yikes! Did I mention this is hard? But we really think it is an important part of our Christmas goals, so for now we will do our best to keep it simple and focus on the reason for the season. 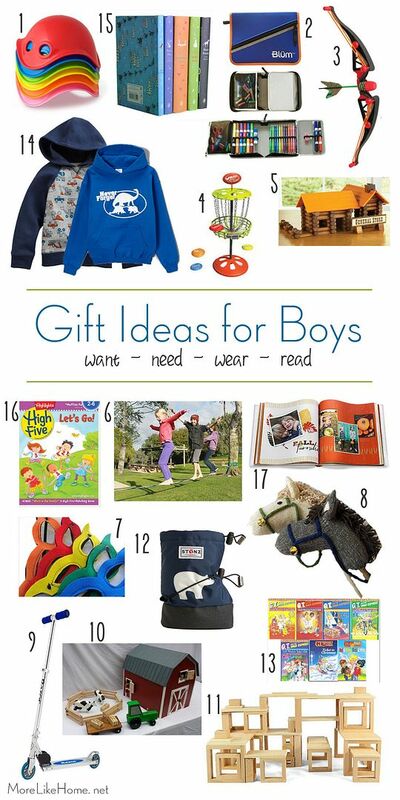 I'd love to hear how you keep thing Christ-centered and your favorite gift suggestions for boys! P.S. Check out our stocking stuffer ideas and ideas for a Christmas Eve box later this week!